Thursday: First I Spoke with Senator Rand Paul – Then I Crashed George Allen’s Birthday Party | Virginia Right! Well, last Thursday was a day like most any other. 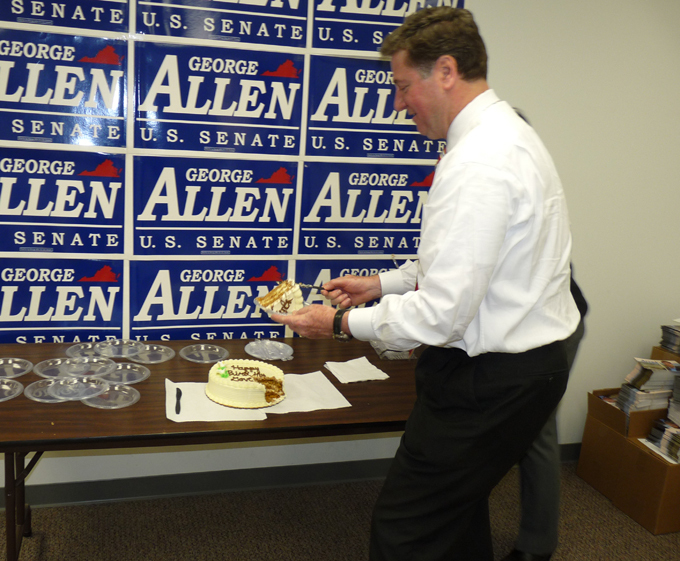 I had an afternoon conference call with Senator Rand Paul to discuss the new budget plan the Republicans are releasing, then I hopped in the car and drove over to the campaign Headquarters of US Senate Candidate George Allen and proceeded to “crash” his birthday Party. Well, not exactly crash. I was invited to a blogger’s event that apparently didn’t materialize due to scheduling issues. But nobody told me! After a few embarrassed apologies from some red-faced staffers, I told them it was no big deal. I’d catch up with Governor Allen many more times before the primary. If you haven’t noticed, he is pretty much everywhere these days! And he is scheduled to speak at the local Republican Committee meeting this week as part of an ongoing “meet the candidate” series that featured Candidate Jamie Radtke the previous meeting. It seems that after a quick celebration of the Governor’s birthday (it was the silver anniversary of his 35th birthday!) featuring campaign manager Mike Allen paying off on a money bomb “bet” (they hit the goal!) by singing happy birthday, the Governor had a radio call in spot to do and then off to another event. I was fine with heading on to my next appointment that day a bit early, but George Allen wouldn’t hear of it. After the not too bad serenade, George Allen wolfed down a bit of birthday cake (Susan – he skipped most of the icing) he called me into his office to chat a bit before he had to call into the radio show. Well, I mentioned in the title that I had a conference call with Senator Rand Paul to discuss the Senator’s budget plan entitled “A Platform to Revitalize America: Senator Rand Paul’s Balanced Budget for FY2013“. The plan balances the budget in 5 years by reducing spending $11 Trillion Dollars over President Obama’s massive and bloated budget. The plan not only balances the budget, but achieves a $111 Billion surplus by 2017. One of the more intriguing aspects of the plan is the total elimination of Medicare in favor of placing Seniors on the exact same medical plan that Congress uses. One thing that Republicans tend to do with entitlement reform is actually offer plans to fix them and allow them to remain solvent. Unfortunately, this approach involves spending less money and gives Democrats an opportunity to use scare tactics – especially with the elderly. You know how they like the optics of pushing old people in wheelchairs over a cliff. But when a congressman actually invites the elderly to enjoy the same plan that they use, well, Democrats are going to look pretty silly trying to trash that one. I discussed this aspect of the plan with Allen a bit, but the Governor had not seen anything on the plan, so it is unfair to ask him to comment on the record on something he has not seen. But the plan also eliminates several departments such as the Department of Commerce, Education (retains Pell Grants) HUD and Energy – but transfers nuclear research and weapons to DOD. And it privatizes the TSA, repeals ObamaCare and Dodd-Frank, opens ANWR for oil and gas exploration and permits the XL Pipeline. I asked Senator Paul to expand on the Medicare aspect and it should be noted that per senior annual expenditures go from $11,000 per person to $7,000 per person while out of pocket expenses and co-pays go down. It is pretty amazing what free markets can do! Here is a copy of the highlights. So after a few minutes, it was time for Allen to call into a radio station for an interview. Taking that as my cue to leave, I began to rise. George Allen put the call on speaker and told me to have a seat. I was OK with that! Unfortunately, the telephone speaker was not cooperating with radio technology and the former Governor was forced to pick up the receiver. It was a bit awkward only hearing one end of the conversation, but I could pretty much guess the questions by the answers. But one got pretty heated. “I refuse to discuss internal personnel issues,” Allen said sternly. Ahhh. This was about Peyton Manning. In the interest of full disclosure I have been a Colt’s fan since Johnny Unitas was their QB. So, Manning is a hot topic with me and there was speculation that the Redskins may be interested, but Denver seems to have the upper hand right now. After his interview ended, we discussed football a bit more and moved to Energy. George Allen is an expert on the subject and I mentioned that there was a vote in the Senate (according to Senator Paul) on bypassing President Obama’s decision to bow to pressure from radical environment groups and kill the XL Pipeline which would bring Canadian oil to American refineries providing jobs and a much needed oil supply from a friendly nation. As we were talking, the vote came in. The measure failed, but managed 57 votes. It needed 60, but that indicated there was some Democratic support. And Allen started enumerating the names of the Democrats he thought probably voted for the pipeline and was spot on with all of his “guesses”. He is familiar with the jobs and energy situation in every state and instinctively knew which Democrats would be natural allies on energy issues. As we left the Parham Road Headquarters, a thought occurred to me. A number of people take issue with Washington “insiders” and politicians in general. The fact that the radio host asked George Allen about Peyton Manning and the Redskins made me think. Allen could also be considered a football insider. His knowledge, experience and opinions are what makes radio show hosts ask his opinion on Manning. When have you ever heard anyone ask Tim Kaine about football? The truth is, it is not his area of expertise (although I’m not sure what his area of expertise might be). But Allen’s opinion matters. And to those who think a Washington “insider” is not qualified to run the country, why should politics be different than football? I watched the wheels turn in Allen’s head as wondered if the Senate Republicans had squeezed every Democratic vote out on the XL Pipeline. It might not be popular these days to be considered an insider, but there is value in the experience and knowledge that comes with being an insider. When is the last time you heard anyone ask Peyton Manning his opinion on the XL Pipeline? VA State Senator MARK OBENSHAIN addresses Mech. TEA Party this Thursday (3/15) at 7pm at the American Legion Building 8700 Bell Creek Rd Mechanicsville VA 23116. http://www.MechanicsvilleTEAparty.com for more info. CUCCINELLI coming in on APRIL 5th. Very interesting post — great analogy.